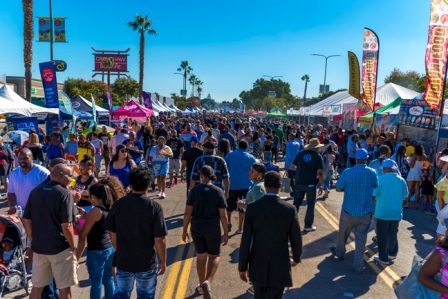 Saturday, October 20, marked 13 years of the largest street festival in Southern California and the Taste of Soul (TOS) nation still hasn’t come down from the festival high! 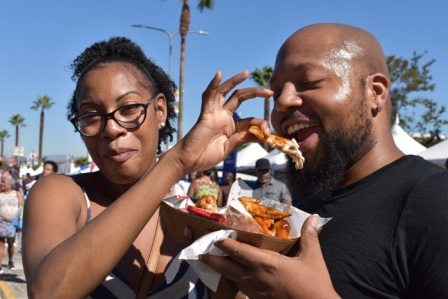 This year, more than 300,000 community leaders, city officials, Black business owners and local residents came out to Crenshaw Boulevard to “feel the love” and celebrate the return of the festival while basking in the ambiance of all things soulful. This year, the Taste of Soul nation had the opportunity to experience music from the sounds of four different stages. 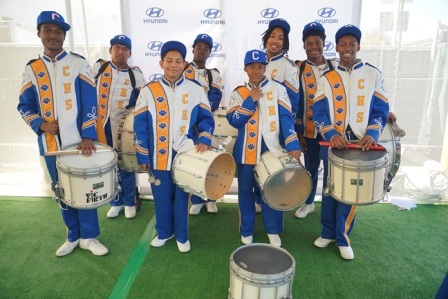 First, the Hyundai Soundstage featured artist Ginuwine, Chante Moore, Kurtis Blow, Teddy Riley, Blackstreet, Melanie Fiona and the StarQuest Singing competition. The stage was hosted by Roland Martin with DJ B-Hen on the ones and twos. 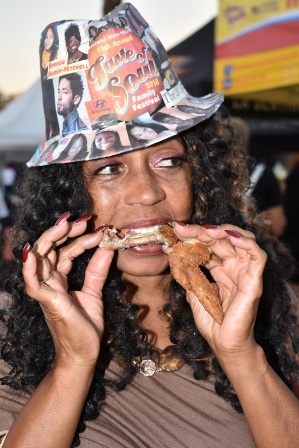 Attendees were also entertained by the 102.3 Radio Free KJLH Stage which featured artists Jussie Smollet, En Vogue, Macy Gray, Ready for the World and more. The third stage, sponsored by 94.7 the Wave featured Sister Sledge, Jody Watley, DW3, Chosen Gospel Recovery Group and more. 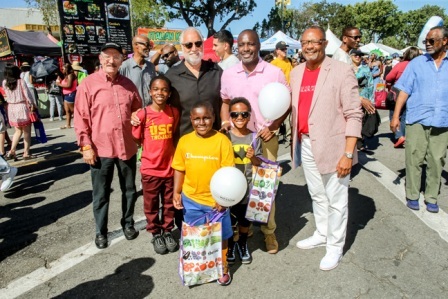 Finally, the Brenda Marsh-Mitchell Gospel Stage sponsored by McDonald’s, brought praise and worship to the streets of Crenshaw with performances by local choirs, Donald Lawrence, Ricky Dillard, Deitrick Haddon and more. Let’s not forget the food. 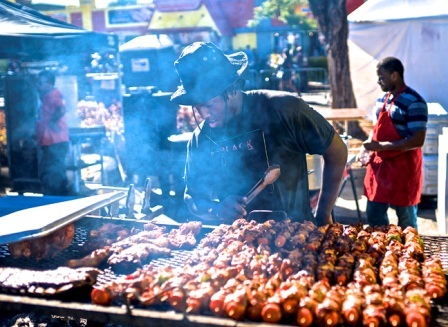 Festivalgoers were also able to purchase a large variety of different beverages, desserts and food including: African, BBQ, American, Creole and Jamaican, Seafood, Vegan food, pies, popcorn, funnel cakes, snow cones, banana pudding, cobblers, cotton candy, smoothies, teas, beer, lemonade, hot toddy’s and more! Aside from the food and entertainment, festival sponsor Hyundai allowed people to enter for a chance to win a brand new 2018 Hyundai Kona at their Hyundai consumer tent. Additionally, people were able to purchase paintings, accessories and clothes, get haircuts, and buy books. One new addition to Taste of Soul was the LeadersUp Taste of Opportunity Pavilion which hosted a hiring fair. In the pavilion, event goers were able to interview for positions and submit applications at different business including UPS, FedEX, Target, Starbucks, the hotel industry, and the entertainment industry. The Taste of Soul also featured Children’s World. There, parents were able to drop off their children before heading over to the entertainment stages. This year, Children’s World had a free vision mobile clinic through Vision to Learn which gave out free pairs of glasses to children to help them thrive in the classroom. Additionally, Children’s World offered games, prizes, activities, and child-friendly entertainment. 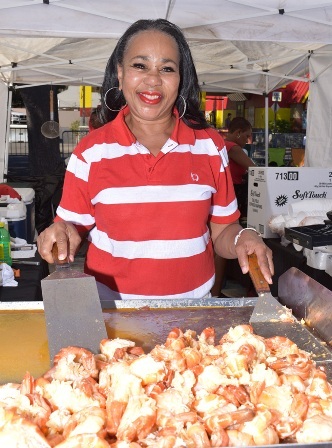 The Taste of Soul Family Festival was also a one-stop-shop for resources and health services. 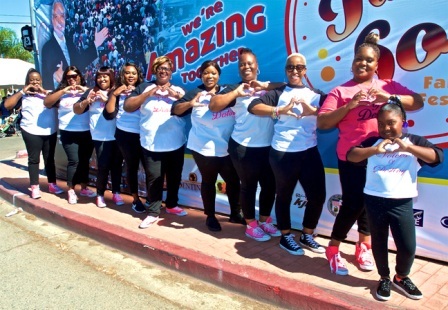 This year, attendees were able to receive mammograms, get tested for HIV, and check their blood pressure, amongst many other valuable health screenings. Chairs: Los Angeles Mayor Eric Garcetti, Council President Herb J. Wesson Jr., Councilman Marqueece Harris-Dawson and Los Angeles County Supervisor Mark Ridley-Thomas. Co-Chairs: Congresswoman Karen Bass, Councilman Curren Price, Assemblymember Reggie Jones-Sawyer, Assemblymember Autumn Burke, LAUSD School Board Member, George McKenna III, KCBS Pat Harvey, and Ivie McNeill & Wyatt. Sponsors: Hyundai, LeadersUp, LA County, McDonald’s, Airbnb, Bank of America, LADWP, Chase Bank, Kaiser Permanente, Plenary Group, Walsh/Shea, South Coast Air Quality Management District, Lyft, City National Bank, Metropolitan Water District, West Basin Municipal Water District, One West Bank, California Resources Corporation, Californians for Energy Independence, Wells Fargo, Charles R. Drew University, AT&T, US Bank, Martin Luther King Jr. Community Hospital, SEIU Local 2015, City of Hope, Southern California Gas Company, Watts Health, St. John’s, DaVita, Covered California, Good Samaritan Hospital, Easy Choice Health Plan, Brotherhood Crusade, Learn 4 Life, Cedars-Sinai, LA City Workforce Investment Board, Los Angeles World Airports, Comerica Bank, MetroPCS, South Hill Petroleum, and E&B Natural Resources. Partners: Bakewell Media, Los Angeles Sentinel Newspaper, Mothers in Action, Brotherhood Crusade, City of Los Angeles, County of Los Angeles, CBS2/KCAL9, Radio FREE 102.3 KJLH, 94.7 The WAVE, AAUC, Metro (Taste of Soul’s official transportation partner) and law firm Ivie, McNeill & Wyatt. Additionally, Bakewell Media would like to extend a thank you to all of the community members who continue to support the mission of Taste of Soul. See you all next year!